LEN - www.lankaenews.com | Strikers abjectly capitulate after making loud and proud speeches ! Strong public opinion railways shall be privatized ! 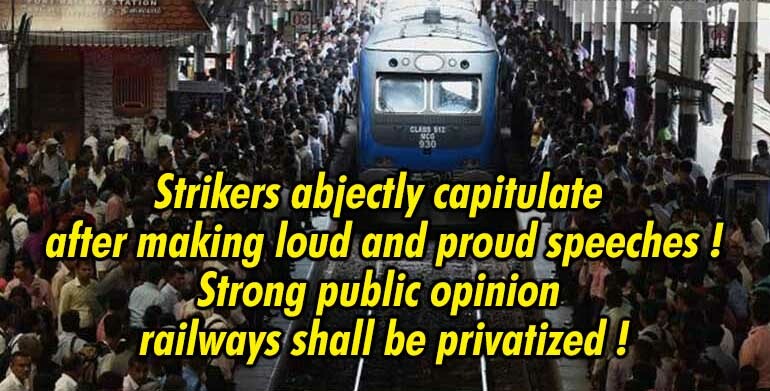 (Lanka e News 14.Aug.2018, 11.45PM) The sudden railway strike staged by a few employees causing untold hardships to commuters citing false and flimsy grounds that their salaries and those of their assistants are being brought on par when the true underlying reason prompting the most unjustifiable and unreasonable strike was the necessity of the engine drivers , station masters and railway controllers to maintain their class distinction , finally came to an end Sunday (12) . The self seeking so called union leaders addressing the media Saturday made proud and loud announcements that they will not abandon the strike . However after miserably failing in their sabotage attempts and activities for the last 4 days , they went all the way to Polonnaruwa ,and following the meeting with the president decided to abjectly capitulate and end their absolutely unjustifiable strike. The Railways department comprises about ten thousand employees. But only about 2500 of them took part in the strike . This few were with the union leaders who learnt an unforgettable lesson and received a well deserved thrashing from the enraged public who chased after them and attacked. If the alleged salary anomalies are to be eliminated as demanded by the strikers, that could create more anomalies in the salary structure of the entire government sector .Hence the finance minister took the stance that the Salaries Commission should decide on this. The finance minister therefore took a firm stand based on justifiable grounds that the strikers must first call off the strike before coming for discussions. The strikers who abjectly capitulated finally terminated the strike after meeting the president today , and decided to discuss with the finance minister thereafter . According to unofficial sources , the government had incurred a loss of Rs. 70 million because of the strike. However since this unjust lightning strike was staged during the period of the GCE adv. Level exams causing undue suffering and despair to poor innocent students , the loss monetarily on that account is immeasurably immense to society . It has become very clear now the strikers after engaging in this unjustifiable and unconscionable action had been direly searching for reasons to end the strike. Though the railway union expected the support of the private bus operators , the latter who chose today to stage a strike on the other hand decided otherwise. Consequently the railway strikers were plunged into deep treble trouble. Yet they had strong motive to cling on to some last straw as a face saving exercise. Above all what forced these selfish ,self centered self seeking union scoundrels to give up the strike was the strong public opinion which was building that the railways shall be privatized inspiring the government to hold discussions with a view to send a group of members of the SL forces to India for railway drivers training , and engage them in the railways service .